Sensirion presents its latest liquid flow sensor, the SLF3S-1300F, at the Electronica and Compamed 2018 trade fairs. By combining the firm's 20-year track record in low and lowest flow rate sensing with a radically optimised mechanical design, the SLF3S-1300F takes the well-established functionality to the next level in price-performance ratio. The sensor provides maximum safety, stability and long-term reliability for a wide range of applications, including the fields of diagnostics, analytical instruments and life sciences. 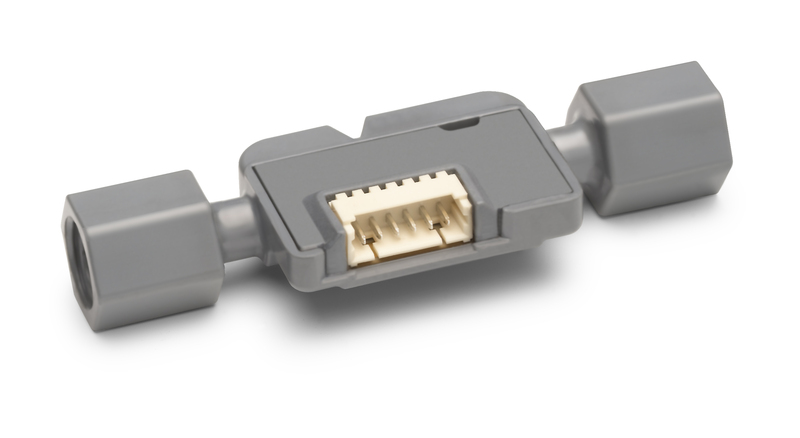 The new liquid flow sensor is based on Sensirion’s proven CMOSens technology and optimises costs by simplifying the design without sacrificing the easy fluidic, electrical and mechanical connections. The straight and unobstructed flow channel has no moving parts; inert wetted materials provide outstanding chemical resistance and excellent media compatibility. In measuring flow rates up to 40ml/min bi-directionally, the sensor allows monitoring the entire system operation and detecting common failure modes. The SLF3S-1300F enables applications in the fields of diagnostics, analytical instruments and life sciences to reach excellent fluid control, system reliability and thus new heights in performance and end-user satisfaction. Its compact form factor and cost-effective design permit system designs with one or more sensors that were previously unfeasible.